This meatless layered taco dip packs a ton of seasoned flavor and is perfect for any holiday or game day party. Be sure to serve dip with plenty of tortilla chips and in a glass bowl so that guests can customize each scoop with the flavors they like! 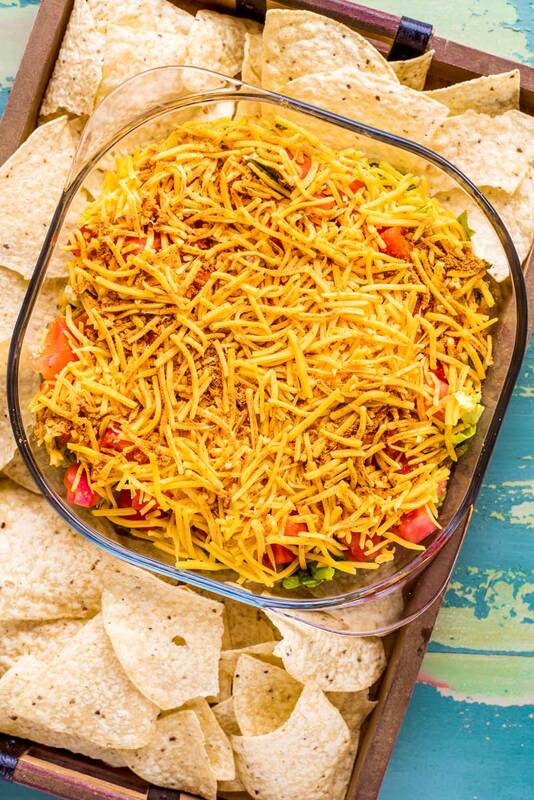 Whether you’re planning for the holidays or a game day party, there are few appetizers quite like taco dip. It’s as easy to throw together as it is tasty, and to top it all off, you’re almost sure to have a house full of taco lovers waiting to devour it. Because, really – who doesn’t love tacos? At least a little bit? Plus, when whip up a taco in dip form, you do away with all that hard-to-eat-oh-no-all-the-filling-is-falling-out-the-other-side problem. All you have to do is grab a chip, scoop, and go! Now, I may be a little biased here, but I think the try magic of this dip is in the layers. I consider myself an appetizer aficionado, not only due to this little food blog but because I just so happen to be one of those hopelessly socially awkward creatures who latch on to the appetizer table at a party as if it’s my lifeboat (which, well, it kind of is, saving me from talking to all the other people in the room). Needlessly to say I’ve spent a great of time slowly snacking and appearing to be intensely interested in cheese plates, napkin displays, and the arrangements of plastic cutlery in red solo cups. So, like I said. I’m a professional. And it is my professional opinion that layered dips are not only delicious, but also fun. With a layered dip, each scoop is a new adventure. You never know what flavor combination you’ll be able to snag. Will you get a scoop with an extra dose of cheese? Will you snag the biggest tomato slice? Did you dip far enough to reach the coveted creamy bottom layer? Guess you’ll have to grab a chip and find out what you get! How do you make taco salad dip? There are many incarnations of taco dip, but this variety is meatless, so the assembly is much simpler. First layer – This is the heart of the dip and what your guests will be digging to reach. It’s a combination of cream cheese, bean & cheese dip, and a touch of taco seasoning. Second layer – Next comes the chopped lettuce. Ideally, the lettuce should completely cover the creamy bottom layer, as it will act as a moisture barrier from the juice of the tomatoes. It will help the first layer stay creamy. Third layer – A couple cups of chopped tomatoes are added on top of the lettuce. Fourth layer – Top the dip off with a big portion of cheese. A little more taco seasoning is also sprinkled on top, which helps keep the taco flavor consistent as people scoop into the dip. How long can you leave out taco dip? As with any appetizer, you’ll want to keep track of how long it sits out at room temperature. As stated above, this dip looks best when served in a clear dish. It’s more fun to dip when you can see all the layers! In a large bowl, add cream cheese and bean and cheese dip. Using a spatula, mix the ingredients together until well incorporated and no clumps of cream cheese are visible. Add 1/2 of the taco seasoning to the bowl, then mix to combine. Pour cream cheese mixture into a 8x8 baking dish (if possible, use a glass dish for best presentation) and spread into an even layer. Add shredded lettuce to the dish, spreading it out so that the lettuce completely covers the cream cheese layer. Top lettuce with chopped tomatoes, then sprinkle shredded cheese on top. Finish by dusting the top of the dip the other 1/2 of the taco seasoning on top. Serve taco dip immediately with tortilla chips for dipping. I love layered dips, and this sounds scrumptious! Lol’d at your comment about the appetizer bar being a safe haven for the anti-social haha. I totally find myself hanging out there more than not.